Send and receive text messages, answer phone calls, and receive notifications with Apple's most powerful watch to date. The Series 3 features a second-generation OLED Retina display with Force Touch, and is powered by the S3 dual-core processor whilst running on watchOS 4. Connect to your iPhone via Wi-Fi or Bluetooth to access text, phone, and notification features. 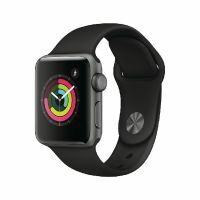 With built in GPS and featuring a heart rate sensor, accelerometer, gyroscope, and barometric altimeter, the Apple Watch has plenty of features for fitness fanatics. This Space Grey watch has a 38mm display and comes with 8GB of storage.